The 2012 United States Mint Proof Set® continues the annual appearance of one of the most popular numismatic products offered by the US Mint. Collectors seek out the set to add to their collection because it contains proof quality examples of all of the circulating coin issued by the Mint during the year. Coins in the set are each struck at the US Mint’s facility in San Francisco. 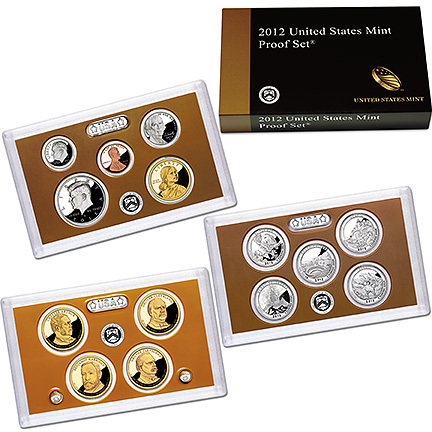 The 2012 US Mint Proof Set contains a total fourteen coins, with a majority of those featuring designs new for the 2012 release. This includes four Presidential Dollars, the Native American $1 Coin and the five 2012 America the Beautiful Quarters®. The America the Beautiful Quarters included in the set represent the eleventh through the fifteenth for the program which debuted in 2010. The set includes a total of fourteen coins all encased in protective lenses to protect their finish. A release date of May 7, 2012 has been indicated by the US Mint. 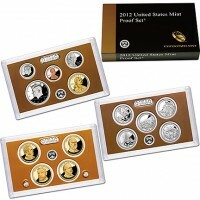 The US Mint has listed a price of $31.95 for the set.